Add timeless adornment to your landscaping edge with this Panacea Rustica Italia Border Fence. Lining a walkway or path with this striking edging creates a defined look in your yard, and the wonderful scrolls and curves offer an elegant hint. Square, steel bars form each piece of fence, and a softly arched top contrasts the straight sides. 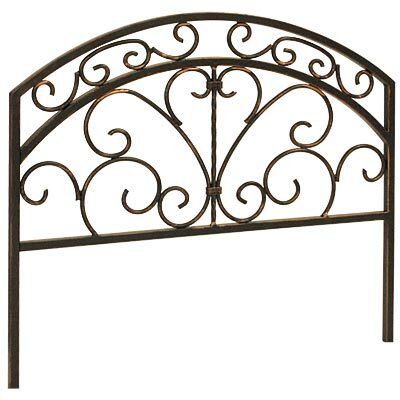 Thinner, steel rods curve and curl inside this frame, evoking classic Renaissance style, and a rubbed bronze finish offers an aged effect. The 6" long legs insert into your garden soil with ease, and a horizontal bar along the base supports the adornments. Its steel construction remains durable for many seasons, and the rubbed bronze finish adds dimension. Place a remarkable border in your landscaping using this Rustic Italia Border Fence. Note: This case pack includes 12 of the Panacea Rustica Italia Border Fence Sections.